Perfect for those of us who leave the house wondering if they have left their hair straighteners , iron or any other appliances on. 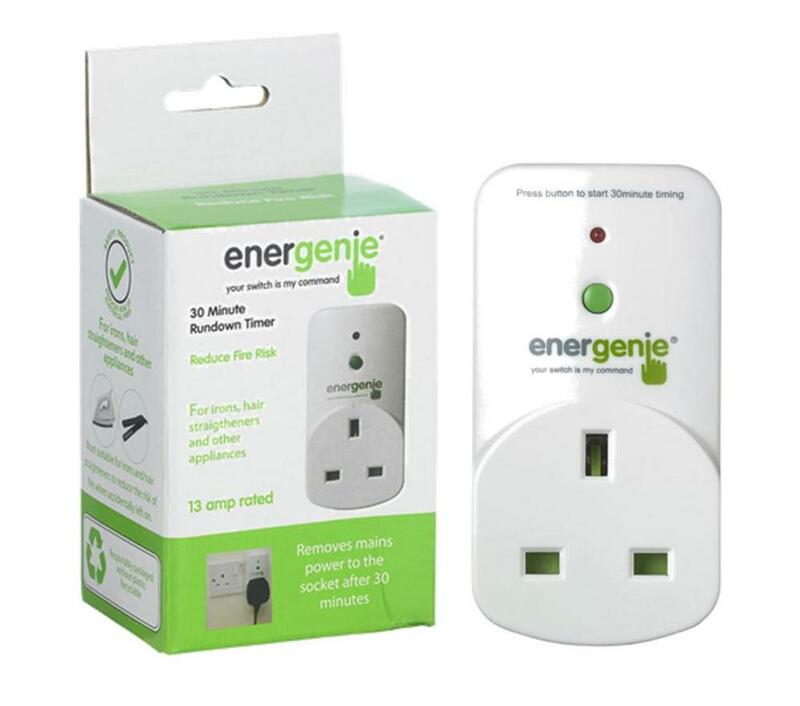 Will switch off the power to your appliance after a preset of 30 minutes should your appliance be accidentally left on. Energenie's 30 Minute Rundown Timer will not only appeal to safety conscious parents, but also to eco chic teenagers. The Rundown timer is simple to restart, you just press the green button and you get another 30 minutes to use your appliance. Q: What appliances can I use this product for? Answer: The device is most suitable for appliances that are better not left connected to the mains for an extended period such as irons, hair straighteners, cu rling tongs and electric blankets. Please note however, that although the power may have been removed from appliances such as these by the rundown timer it may still be hot for a considerable period before it cools down. Q. What devices is it not suitable for? Answer: Appliances that require continuous connection to mains power. Q. What does it actually do? Answer: Pressing the green button will provide power to the socket for 30 minutes. It will cut off automatically after 30 minutes. Q. Is there any set up of the device required? Answer: The only action required is to press the enabling button on the front. The rundown timer period is fixed at 30 minutes. Q: Can this be used with a trailing socket (a multi - socket extension lead) to allow many applian ces to be turned off at the same time? Answer: Yes. Plug the adapter into the wall socket, and then plug the lead of the trailing socket into the adapter socket. Ensure the trailing socket is switched on if it has its own power switch. The socket is rated at 13A which is the maximum for UK domestic usage. Q. Can I use it with my TV or hi - fi to switch them off automatically after I have gone to sleep ? Answer: Yes, but ensure that your TV allows this. Most TVs allow this but note that some most modern TVs do not like sudden removal of power and some require to be continuously connected to the mains. Check your TV’s instructions. Q: Is the device battery powered? Answer : No, it takes it’s small amount of power from the mains supply . Q: Can the adapter be used outside?